Please review this description and our policy on handmade/preorder items in our FAQ, before purchasing! This charm can be used for deco cases, necklaces, key chains, and more. 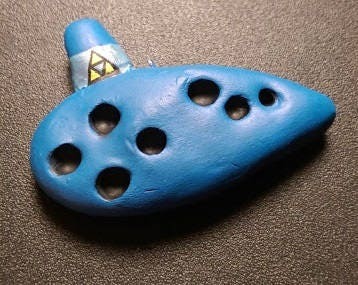 It does not actually play music but if you try really hard it might ;) Please note the ocarina will be glossy. This is not shown in our current photos. * This item is intended for personal use or crafting projects and may not be sold individually for resell purposes. Quality hat, you can tell it's made with care! It looks just like the one from the game! Absolutely nothing but praise for this item. Bought as a gift for my daughter, and the smile on her face said it all. Quality merchandise and a pleasant transaction. 100% recommended. Superb quality product and stunningly good support when our local mail office had delivery issues. Wouldn’t have received the package in time had the seller been anyone else. Cette casquette a été réalisée avec beaucoup de soin et de précaution. La vendeuse a fait preuve de beaucoup de gentilesse et est très attentive aux demandes de ses clients. True Blue QT accepts credit and debit cards, Etsy gift cards, PayPal, and other international payment methods where available. Packages will not be sent until the payment has been received. If payment has not been received within a week, unless it is an e-check, the transaction will be cancelled. True Blue QT attempts to be as accurate as possible and provide the most reliable products. However, we will not be held responsible for slight differences in our handmade items nor for things mentioned in our product descriptions. Each handmade item is made with care and it's slight differences are what make each item so special. We do NOT do exchanges and all sales are final with some exceptions, listed below. ~ You must email us (support@trueblueqt.com) within 2 days of receiving your product/s. ~ You must include a few detailed pictures and provide proof in the email. Please show the damaged items in it's original packaging if possible. ~ The item/s must be returned to us in the condition you received them before we can re-ship or refund. We cannot pay for the return costs. ~ Email us at tabitha.trueblue@gmail.com or contact us through Etsy with your order information. If you purchased insurance and your item/s was lost, damaged, or stolen we will take care of the claim. Once the claim is settled we can reship a new item (if in stock) or refund the original amount you paid. Please do not open a Paypal claim/dispute as this greatly complicates things for both us and the buyer. Sometimes products sell out. In this case, you will only be able to receive a refund instead of receiving the same product. More information on insurance can be found under our Shipping Policy. True Blue QT ships worldwide by USPS and provides tracking numbers. First class, priority, and priority express mail are available options during checkout for both domestic (USA) and international shipping. Processing can take anywhere from 3 days to 4 weeks depending on the amount of orders we have and especially if they are custom orders/made to order. Orders should arrive according to the USPS option you chose at checkout. See below for more details. Sometimes shipping is delayed, especially during and around holidays, and during extreme weather conditions. We have no control over this and kindly ask for your patience during these times. We cannot pay for any international customs. Should this happen, it is the buyer's responsibility. All shipping options include a tracking number. Insurance is only included in priority and priority express shipping. If you would like to include insurance with your first class shipping, you must purchase it from our shop. Please note that insurance is not available for all countries. We package our items to ensure that items will not be damaged. Unfortunately, sometimes, postal services do not handle boxes with care. It is highly recommended to purchase insurance, especially if you live outside the USA. Insurance is only included with priority and priority express shipping. If you do not purchase insurance for first class then you accept responsibility to what happens to it during shipment. There is an option to buy insurance in our store. - Pre-order items can take anywhere from 7 days to 8 weeks (excluding holidays) to create. Please keep in mind that if there is an increase in orders, made to order items may be delayed. In this case, we will contact you. - They will have slight differences (color, size, etc) than the product pictures because they are hand made. There are no refunds or reshipments because of this. - Due to the differences in lighting and monitor settings, the color of the actual product may be slightly different than that of the pictures. * Please be professional and kind in your feedback. If you have an issue with your order, get in touch with us and we'll be happy to help you! We sponsor bloggers, Youtubers, & streamers! If you meet the requirements and would like more information, please send us a message through Etsy or email us at tabitha.trueblue@gmail.com for more information - If sponsorships are currently closed, you will not receive a reply. Content included on this site, such as text, graphics, logos, headers, button icons, and any images are the property of Storenvy, Tabitha Good, other content suppliers, and any other commercial stock photo website, or its content suppliers and protected by international copyright laws. Some apparel are simply replicas and sold as retail from warehouses. They are handmade by our supplier/s with slight differences in design and material. If we see any stolen edited images or images that are copyrighted to us, or listings over the web that have used our products we will report it to platform that it's on and register a legal dispute. True Blue QT's trademarks and trade dress may not be used in connection with any product or service that is not True Blue QT's, in any manner that is likely to cause confusion among customers, or in any manner that disparages or discredits True Blue QT. All other trademarks not owned by True Blue QT's or its subsidiaries that appear on this site are the property of their respective owners, who may or may not be affiliated with, connected to, or sponsored by True Blue QT or its subsidiaries. If we see any stolen edited images or images that are copyrighted to us, we will report it to Storenvy, Etsy, or the social media site it's on. Care instructions vary for each product. Please see product description on the product page for care instructions. Sizing details vary for each product. Please see the product description on the product page for sizing details. We do not sell wholesale or drop shipping. If you have a custom request for a product please leave a note at checkout. If it is a huge request, we kindly ask that you email us before placing your order or simply use the custom order button on our shop's home page.